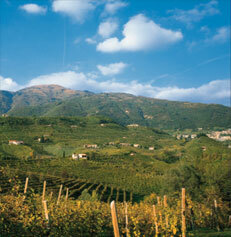 Prosecco is a refreshing white wine from the Veneto region, more specifically areas around Conegliano. General thoughts of Prosecco are those of a sparkling wine. In reality Prosecco is the grape used to make this before dinner favorite. As such, Prosecco can be sparkling, semi sparkling or still. As with all wines in Italy law defines what can be called Prosecco. Legally a Prosecco can have as much a 15% of a combination of Pinot Grigio, Pinot Bianco, Verdisio or Chardonnay. However, the best producers will use only Prosecco to make this festive wine. You also should follow their lead, check the label when choosing your Prosecco. The bubbles in Prosecco are created by the Charmat method, not the method used by Champagne. The Champagne method requires aging and the Prosecco grape has such a delicate and aromatic flavor that aging would damage its freshness. 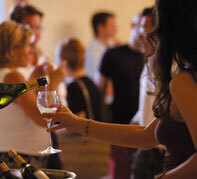 Prosecco should not be confused with other sparkling wines made with the same method. It seems that just about any medium or poor quality white is turned into a bubbly to be able to sell the stuff. Prosecco is not one of these wines. 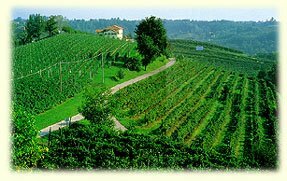 The road of Prosecco, starts in Treviso and winds through a beautiful and rustic area of the hills of Conegliano and a portion of Piave and Valdobbiadene. 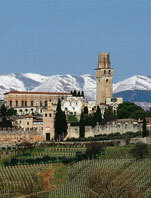 The vineyards are exclusively placed on the hillsides facing north or east avoiding those areas toward the plains. In the early autumn this area is a fantastic destination for a vacation. 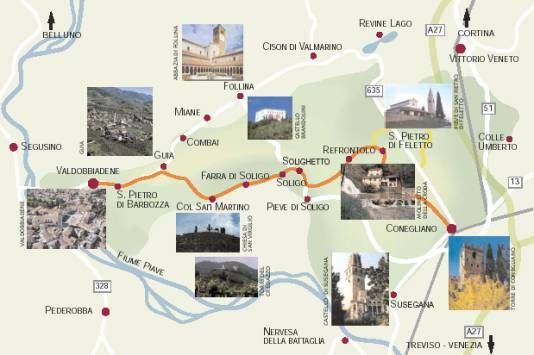 Beginning in Conegliano, through the towns of Refrontolo, Soughetto, Col San Martino to finish in Valdobbiadene, the celebration of the harvests, the medieval churches and towns, the dried meats and fresh cheeses make for an interesting, flavorful and perhaps slightly tipsy vacation. Prosecco, whether sparkling or still, is great for before dinner drinks and celebrations. Delicate in bouquet and flavor, it is perfect with Prosciutto San Daniele, pasta dishes with white sauces or broths, fish, white meats, fresh cheeses and most desserts. Grape: 85-100% Prosecco. 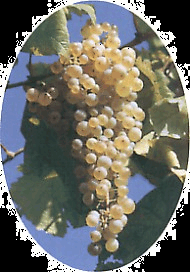 Remaining Pinot Grigio, Pinot Bianco, Verdisio, and/or Chardonnay, up to 15%. Bouquet: Fruity aroma of Apples and Pears, fading into wild flowers. Flavor: Soft but dry with a balanced taste. Initial taste of Apples and Pears, becoming citrus, and finishing with roses, finally a slight aftertaste of Almonds. Serving Temperature: 7-9 degrees c.
Glass: Flute or Stemmed narrow bellied glass. Prosecco will be presented at the tradeshow Vino in Villa, June 27th, 2006. This may be a great opportunity to try one of the finest Italian white wines without going to Italy. Now that I enjoy! Mind you the San Daniele prosciutto is going to haunt me until I try it! Chickybabe - Prosecco is Raffaella's favorite before dinner drink. Does this mean that I will now get a starring part in one of your stories? i LOVE bubbly. and prosecco goes so well with bacalà alla vincentina. can't find a better match! IWG - Thanks for the additional info. Tracie b. Bacala, you know your food!